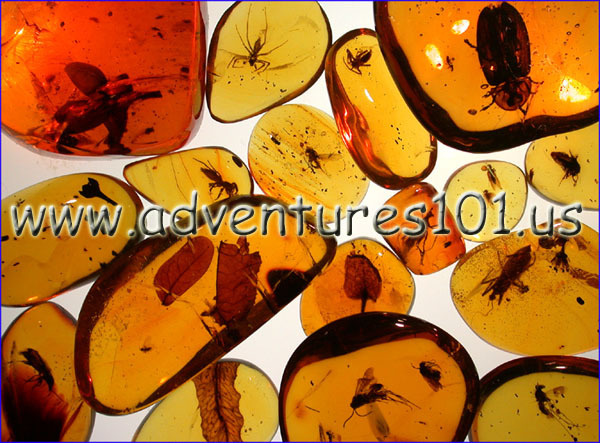 We started excavating amber in New Jersey in the spring of 1993. Back then the amber rich lignite layers were only a few feet below the surface. Over the course of the next 6 years we excavated some 20 pounds of New Jersey amber finding our 800 individual amber specimens with insect inclusions most of which we donated to the American Museum of Natural History. We spent most of our spare time between 1993 and 1998 with our collecting friends removing thick gray clay layers and hundreds of thin laminated sand/lignitic/clay layers to reach the famous '3rd lignite' layer which contained the most amber. This '3rd' lignite layer was sometimes over a foot thick containing large sized botanical matter and crumbled very easily in your hand with virtually every handful containing a beautiful amber gemstone! We have 5 parts to our New Jersey amber pages, the amber specimens and inclusions, the collectors and excavations, and of course the research - please enjoy!